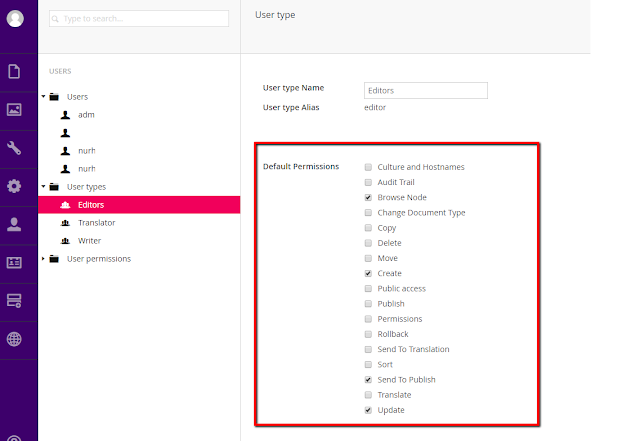 Upgrading from Umbraco Contour to Umbraco Forms: Fix for Could not load type 'Umbraco.Forms.Core.Services.RecordService' from assembly 'Umbraco.Forms.Core, Version=4.3.2.0, Culture=neutral, PublicKeyToken=null'. 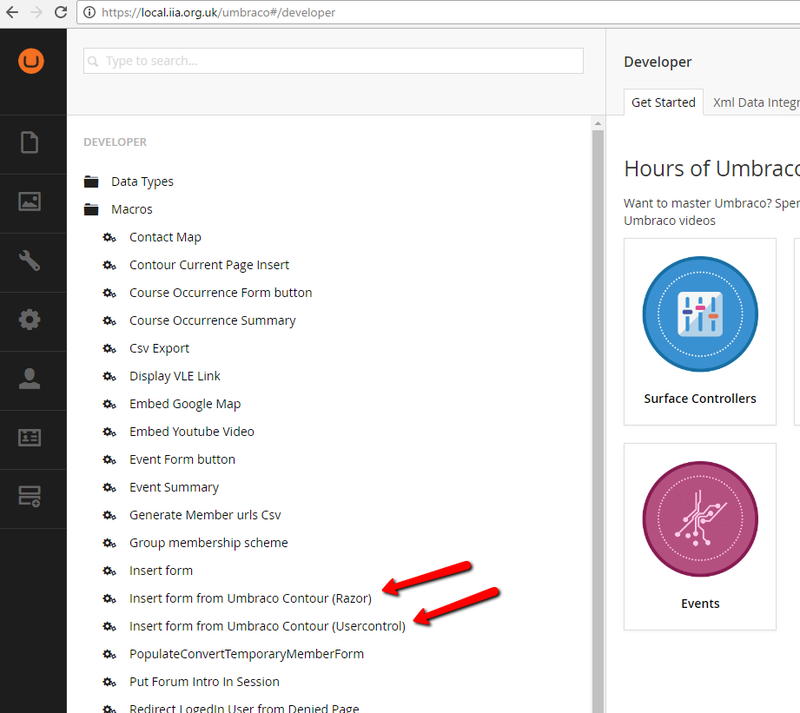 If your Umbraco website is already using Umbraco Contour and if you want to upgrade to Umbraco Forms then you might experience "Could not load type 'Umbraco.Forms.Core.Services.RecordService' from assembly 'Umbraco.Forms.Core, Version=4.3.2.0, Culture=neutral, PublicKeyToken=null'." while installing Umbraco Forms. Please go to this Umbraco Forums url to see how I fixed my problem. 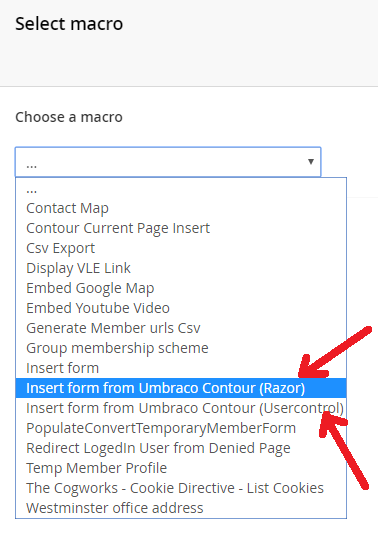 After installing the Umbraco Forms successfully, then you might want to remove Contour items from the Macro Dropdown List. 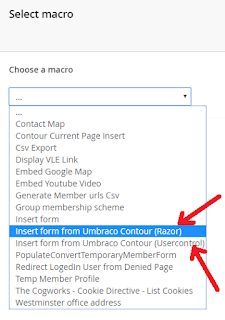 To do that simply go to /Developer/Macros section and delete the Contour items. That is all, hope this post helps. Presumably this is doing an in-browser install? I removed all existing Umbraco.Forms. *.dll files as well as contour references in the web.config and then proceeded to do a Nuget install of Umbraco Forms and didn't encounter any issues. That is great news Simon, that you didn't experience the problems that I had experienced. For my case, it was an old project, using a very old version of Umbraco and the Umbraco contour had been installed as an Umbraco package rather than a Nuget package. After the Umbraco upgrade, I experienced many issues and eventually that is how I managed to install Umbraco Forms. From my experience if you use Nuget package manager to install things, you shouldn't (hopefully) see many problems. 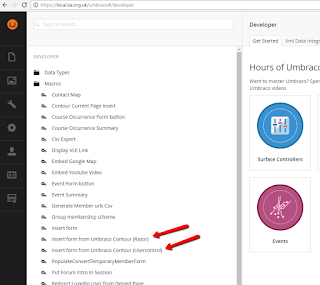 Oh always use Nuget package to install things, including Umbraco.Forms. Hi Nurhak, to clarify, the site I did this on did not have Contour installed via Nuget (I'm not sure there is a Nuget package for Contour). I installed Umbraco Forms via Nuget but I guess it could just have easily be installed via the package manager in Umbraco as well but in my case I needed an older version so I didn't have to upgrade Umbraco as well. Hi Simon, thanks for your comments. I can't remember now whether there is a Nuget package for Contour or not(I had a quick search, couldn't find anything about it), but as it was installed using the package manager in Umbraco, it caused lots of trouble at the time. And I strongly recommend people to use Nuget package manager to install things(if they can), rather than package manager in Umbraco as it causes problems at some point(for my case a big umbraco upgrade). Fix for "Websites cannot be started unless both the Windows Activation Service (WAS) and the World Wide Web Publishing Service (W3SVC) are running, Both services are currently stopped"
Sometimes after iisreset, it is possible to see the following exception. "Websites cannot be started unless both the Windows Activation Service (WAS) and the World Wide Web Publishing Service (W3SVC) are running, Both services are currently stopped"